The earliest settlers to the Catawba Valley region, including the Stanley Creek area, had no houses of worship in the first years. Pastors or preachers were not among the first settlers. An attempt to escape religious persecution from the Church of England, in their homeland, brought some of the first settlers to North Carolina.. They believed that the Anglican Church, or Church of England, was weak in this colony. The German immigrants, from the Palatine region of Germany, were Protestants, as were the French Huguenots who came to this country with the Germans. They consisted of Lutherans, Calvinists or Reformed. Though industrious workers, they were generally farmers who spoke the language of their homeland and knew little English. Their churches were in the country where they farmed. Before the immigration of pastors, the prayers would be read to these German farmers by the local school teacher and sermons would be preached, usually in someone's home, by self appointed missionaries. Below are listed a few of Stanley's earliest churches. "Echoes and Shadows of Two Centuries"
It is quite possible that the origins of the Lutheran Church in Stanley came from the Old Whitehaven Church which began in what is now Lucia. The church was begun by Rev. Robert Johnston Miller, an Episcopalian minister. Since there were no other ministers within hundreds of miles in the 1700's, people of different faiths congregated at Old Whitehaven for worship. The majority, Lutherans, urged Rev. Miller to accept ordination into the Lutheran Church, which he did. An old cornerstone of the first brick church building shows that the founding date is 1841 at which time the church was called Chryst's Church. The first building, itself, was built two or three years later. A deed dated October 9, 1843 indicates that Robert A. and Ephraim Brevard, sons of Alexander Brevard, gave land for the erection of a Lutheran Church. Trustees for the church were David Lineberger and John F. Cannon. It is assumed that the first building was constructed within a short time thereafter. It was on oblong frame structure, with two front doors leading to two aisles and was located very near the same location of the present church. As was common practice in the area during the 1700's and early 1800's, the church also served as a school. Later, in 1899, the congregation saw the need for a more substantial building. The motion was made and carried to build a brick church. Much of the work was done by members of the congregation among whom were the names Jenkins, Lineberger, Nantz, Peterson, Stroup and Withers. The church was said to have cost $2,500. Construction of the new brick church wasn't completed until November of 1901. The church has shown steady growth during these 150 years, from forty charter members in 1841 to a baptized membership of 216 in 1941 at the them of the centennial, to 546 in 1991 in the sesquicentennial year. The Stanley United Methodist Church dates back to 1815, when the Providence Methodist Episcopal Church was established near Dutchman's Creek midway between Stanley and Mt. Holly. It is believed that in the first years the Providence Church was merely a brush arbor, but later a "meeting house" was built. The church became the Methodist Episcopal Church South in 1859 when the congregation moved to the eastern edge of what is now the town of Stanley, then called Stanley Creek. There was a brush arbor at the Stanley Creek site which was large and vastly attended by people who traveled from the surrounding areas in Gaston and Lincoln counties. Many circuit ministers preached there. On 26 April 1884 a transaction was completed for the sum of $50 whereby August and Jeanette Farley sold to the trustees a parcel of land containing one acre bordering the Carolina Central Railroad in Brevard's Station. At the same time trustees began to sell portions of the campmeeting property. Then in 1891 the Trustees of the Stanley Creek Church were instructed to sell the land on which the church then stood and the proceeds were to be used towards building a new church nearer the railroad station. Shortly thereafter a new church was built, on East College Street, near the location of the present day Community Building. The land consisted of 22 acres. Between 1936 and 1940, three acres of land was purchased on which stood a two story dwelling which had previously been the home of Miss Mary Smith. That became the new Methodist parsonage. In the 1940's construction was begun on a new church as it moved to the new location on North Main Street. In 1959 a project was begun to enlarge the sanctuary and to construct an educational building. This program was completed in April, 1960. One of the first missionaries sent from N. C. Baptist State Mission Board to this area was Rev. Robert Bruington Jones. A church was organized on Saturday, October 29, 1853. The church that was organized by Rev. Bruington Jones, once stood at a hill west of the old road to Mt. Holly. The first church roll was made of of thirty eight people. Of those listed as members twenty three were white and fifteen were black. After the Civil War, churches were started by the black people. Many people went west. The roll, that at one time had listed 417 names, now had only 76. The land around the church had been bought and fenced making it difficult to get to the church. In 1872 a conference was called to discuss what could be done. They voted to move the church to the spot where Hickory Grove now stands. Even though 50 of the 76 present voted to move the church, twenty-six refused to go with them. So the new location, that was to be Bruington was given a new name, Hickory Grove. In June 1872, the Pastor, George Fite, leader of those left behind, took 13 members and formed Fellowship Baptist Church in Belmont. In July 1872, again a conference was called of the 13 left. Only eight were present. Pastor Will Upton and Jack and Billy Hansel voted to disband. Five women "rose up" and said that they were not going to give up. They could do something. The majority voted to move to another location. The old church building was torn down and moved to the triangle made by Old Mount Holly and Morris Farm Roads. Another log building was added, and for their summer services a brush arbor was built. Regular services were held and many additions were made. Hickory Grove's history seemed to see the hand of God in all of this. Their comment was: "The old church then became three active churches." By 1883 the Rev. John F. Morris was serving Bruington Baptist Church as well as Hickory Grove. They began to see the need for a better location and a larger building. About June of 1885, they decided to move to Brevard Station, as Stanley was then called. A two acre lot was purchased. The new church was built and dedication services were held on May 31, 1891. In November of 1965 the church voted to relocated to ten acres owned by Mr. & Mrs. S. O. Brandon, to almost the exact spot where the church began in 1853. 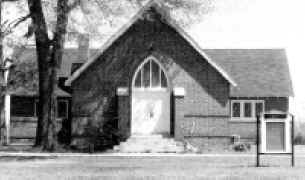 The first service was held in the new church building in March of 1970. Recognizing that the church was the first Baptist church in Stanley, and realizing that there are three other Baptist churches in town, the church voted to change the name to First Baptist in September of 1969. Blacks and whites worshiped together at Bruington Baptist Church (a white organization) located between Stanley and Mt. Holly. There were 25 members, 13 whites and 12 blacks. As time passed, people living near the church built a fence that made it difficult for members to get to church. Because of this, Bruington Baptist Church disassembled somewhat. The 12 black members organized Galilee Baptist Church located on Hickory Grove Road in 1863. The members elected Rev. Tom Barnwell as the first pastor of the church. Several years later Galilee Baptist Church was destroyed by fire. On September 18, 1874 Rufus and Susan Friday stepped in and decided to do something for their fellow man; they donated land for a new church to be built upon. During the pastorate of Rev. Burton a log structure was built. The church was named after the Rev. Burton's hometown of Springfield, West Virginia. In 1908, Rev. R. D. Harris accepted the church pastorate and served for 21 years. Under his leadership the church progressed spiritually, financially and physically. The members wanted to glorify God by providing better facilities. After an enormous amount of work and sacrifice, the church was completed. On 14 January 1928 the Gastonia Gazette reported: "Thursday evening was a great event with the members of Springfield Baptist Church when they opened their newly erected brick church which cost approximately $10,000. When the doors opened they walked in with the church free from indebtedness." In 1982, plans to build a new sanctuary were finalized. On November 11, 1984, Rev. Theodore Armstrong Jr. led the Litany as ground was broken for the sanctuary. The new sanctuary is the second phase of a building program which also included enlarging and completely renovating the fellowship hall, additional classrooms, and a library. The project was complete August 18, 1985 in time for dedication services. Before 1891 there was no Presbyterian Church close by to the Stanley area. The nearest churches were Castanea at Lucia, Ironton at Iron Station and Goshen at North Belmont. There were no paved roads at this time so travel to and from a church by horseback and buggy was rather rough, especially in winter months with the cold and mud. Due to the above reasons, Presbyterians in our area petitioned the Mecklenburg Presbytery to organize a Presbyterian church in Stanley. On November 27, 1891 the Mecklenburg Presbytery met in Stanley Lutheran Church to consider the petition to organize a church in Stanley. Ten members (with baptized children) from the Goshen Church, five members from Castanea Grove Church and one member from Ironton church presented their certificates to be members of the new church. 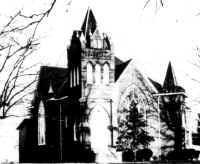 The first services were conducted January 3, 1892 by Rev. William E. McElwaine and were held in the Lutheran Church. During the years of 1892 and early 1893 the first church was built. Much of the labor and materials were donated. The first meeting for services in the new building was held February 5, 1893. Mount Pleasant United Methodist Church founded in 1898; Alexis Baptist Church, organized in 1903 from Mt. Zion Baptist Church; The Stanley Pentecostal Holiness Church which began holding meetings in the 1930's; Community Pentecostal Holiness Church founded in 1966; New Life Baptist Church which started as a mission from Bruington Memorial Baptist Church in 1959; Stanley Church of God, organized in 1949; The Christian Brethren Church pastored from 1923 until 1969 by the Rev. William McCulloch; and Craig Memorial Baptist Church.